As this side-quest cannot be initiated without Jolee, it has been moved here. In the mercenary enclave area of Ahto west you will automatically be approached by Shaelas who asks about where your loyalties lie. Say that you hate the Sith, and Shaelas will ask you to investigate what happened to his daughter, as well as other Selkath youth that have disappeared. If you ask around, the others in the bar here will tell you that the Iridorian may know something about this. Don't pay Gonto for this information, it's not worth it, but you can force him to tell you either by threatening or force persuasion for some DSP. In any case talk to the Iridorian and convince him to tell you what he did to the Selkath Youth for 150 XP. You can do this either by persuasion (medium difficulty), bribery (bugged) or Force persuasion. Interestingly enough even if fail the persuade check if Bastila is in your party at the time she'll persuade him to tell you anyways. In any case once you've discovered his role in the abducted youth you can report this to Shaelas if you wish though you won't gain anything from it. Now that you've finished the preliminaries continue with the main quest until you enter the Sith Embassy. Once there, there are two ways to get to the Selkath youth. The first way is to go to the east to the Flow Control Room, clearing out enemies as you go. Once there use the Door Control on the left to clear that chamber of water (one of the controls on the right path is malfunctioning). Use the flow control in the next chamber, after which just proceed through the remaining chambers. The only other way is to hack into the computer panel west and north of the Disassembly room. Disable the force field in the Security Room to allow passage to the northeast half of the base. You can take the easy path and say "Good, I knew the Sith would win." They will be friendly towards you and you'll gain a few DSP and 500 XP. This is the worst of the three options. You can kill them all for 600 XP + whatever you get for killing them, as well as some good items that you can loot off of Shasa's corpse. You can do so without gaining DSP if you wish by saying that if they side with the Sith then they must die, rather than saying that you're there to kill anyone who gets in your way. You can redeem them from the dark for 700 XP. You can force persuade them using Dominate mind, but you won't get any LSP this way. To convince them that the Sith are Evil, you'll need evidence. In the southeast room of the annex is a dying Sith. The token they give you can be used as evidence but it requires a hard persuade check. If Bastila is with you it will automatically succeed. For more concrete evidence proceed east, kill their Master, and loot the room behind him (mind the deadly plasma mine there). The footlocker contains a datapad which provides the proof necessary. Just bring it to them and they'll leave netting you some LSP. Whether you are redeeming the youth or not you may want the evidence to make the trial easier. If you've already passed through the trial don't bother getting the evidence if you killed them off. Anyways go ahead and exit the embassy and return to Shaelas (The trial is covered in the main walkthrough). You can refuse to talk unless you get some money up front but this nets you some DSP. Reporting to Shaelas will net you some XP (300 if you killed them, 400 if you just left them alone, and 600 if you saved them) as well as 500 credits unless you turn down his money for some LSP. If you still have the datapad you can give it to him though the rewards do not change in any way. This is one of the easiest quests available since you never have to go out of your way to do anything except to talk to the quest giver. In the mercenary enclave area of Ahto west talk to Nilko Bwaas who will ask for your help in uncovering why the republic is hiring so many mercenaries, and promises you 500 credits to report to him. The only thing that needs to be done is to continue on with the main quest until you get access to the submarine, you don't actually have to go down to the Hrakert Rift. Once this is done you can return and report to Nilko at any time for 500 XP and 500 Credits. If you wait until you finish investigating the Hrakert Rift, the dialog will change but the rewards do not. Usually I don't see reason to wait, especially since some of your actions can possibly get you banned from the planet. To get this quest you must first have defeated Calo Nord, after which you need to meet Senni Vek. Accept the datapad that he offers you and then go talk to Hulas in East Central Manaan. Make sure there is no one else in your party when you do so, otherwise he won't talk to you about the Genoharadan. Note that each mission you fulfill will net you some DSP so be aware of that. Anyways accept the vows of secrecy and he will give you two targets to go after. Lorgal and Zuulan. Lorgal is found in the Republic Embassy in the cell next to the Sith Prisoner. There are two ways of dispatching him. First you can just talk to him and force choke him to death if you have that force power. Wound will not suffice, you must have Choke or Kill. You won't get any XP for killing him this way. The other is by slicing the console. It can cost as little as a 1 spike up to 9 Spikes depending on your Computer Skill level. You'll gain some XP for slicing the console. 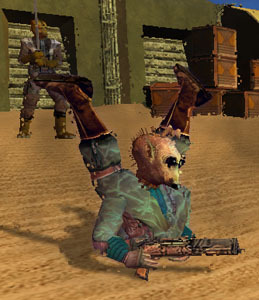 Your next target Zuulan is found on Dantooine east of the Matale's house, though only his speeder is there. If you set a frag mine it will automatically kill him though you won't get any XP for it, whereas if you set the alarm he'll come running over and you can actually dispatch him. If you take out both of his droids or drop his VP low enough he'll beg for his life. It's best not to accept his offer as you can loot his corpse for those 200 credits anyways. Go ahead and kill him for some XP and return to Hulas. You'll get 500 XP each for reporting both Lorgal and Zuulan's deaths as well as a poisoned blade and a blaster respectively. Next you are commissioned to take out three targets, namely Ithorak, Rulan, and Vorn. To meet Ithorak, talk to Vek in the Swoop offices in Ahto East. Force persuading him always works and persuading him normally requires passing a medium persuade check, though if you fail you can pay him 500 credits to convince him. However I would not pay him unless if I had no other choice, such as if I were playing a character with no points in persuade and didn't have the Affect Mind force power. Anyways once you have set up your appointment with him go ahead and transit back to the Ebon hawk and run over to the central landing bay. There you will meet Vek. You can bribe or force persuade Vek to leave but usually I don't do so as Vek gives you a nice bit of XP which you will lose out if you let him go. If you do persuade him to leave you can actually reprogram the assault droid to kill Ithorak, but you won't gain nearly as many XP as you would otherwise. 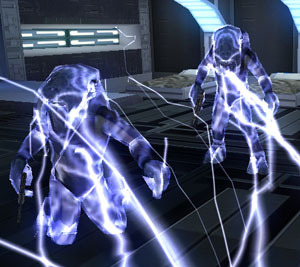 The best option in terms of XP is to attack Ithorak and Vek and the droid for good XP from killing each one. Next stop, Tatooine. Vorn's droid is found in the northern area of the Sand People Territory. The droid will attack you, but it will be disabled if you take down its VP enough. Now that the droid is disabled you have several options in front of you. You can fix the droid and reprogram it to hunt down Vorn, you can plant a frag mine on his bike, or some combination of the above. In most cases the way to get the most XP is to fix the droid up but not reprogram it. Then place a frag mine on the bike and then take him and the droid down. If you are level 18 or above actually letting the robot hunt down Vorn nets you more XP but only marginally. Anyways now that you've taken care of those two go to the Upper Shadowlands on Kashyyyk. In the southwest corner you will find Rulan's hiding spot. When you approach that area you will find a Wookie corpse with a datapad on it. The datapad says that Grarwwaar is dead. However in the clearing ahead you will find Grarwwaar. This of course is Rulan. Talk to him and he will attack. Take him down to only a few VP and he'll change into a Ritual Beast and you'll have to attack again. Defeat him this time and he'll change into a Tach and run off. He'll run into a clearing with 4 other Tach (even if you cleared this entire area of Tach previously). Now it comes down to a guessing game. Personally I prefer to kill off all of the Tach before killing Rulan, but it really doesn't matter. After killing him you'll gain some XP and you'll see his real corpse which you can loot for some cash. Anyways now that all three of your targets are dead go ahead and return to Manaan to report the deed to Hulas. You'll get 1000 XP for each one you report as well as a Stealth unit for defeating Vorn, a visor for defeating Rulan and gloves for defeating Ithorak. Remember that all these items that you get are Genoharadan items and are special, and can be sold for good money. Anyways when you report Hulas tells you that you were used by him to kill the other overseers of the Genoharadan making him the sole overseer. Despite your help he doesn't want you in the guild. You can just let him go, but that really isn't in keeping with what an assassin should do now is it? If you challenge him then he agrees to meet you for a final confrontation on Tatooine and tells you to come alone. Of course this last bit is a lie since you're not a member of the guild anyways. Go ahead and go there and bring along some companions (Jolee works great here). Hulas is there with his thugs. Mop the floor with these idiots and loot their corpses for some nice XP and equipment. 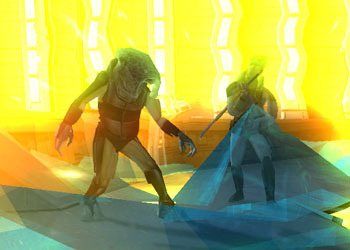 Winning each tier on the Manaan Swoop track nets you not only credits but also XP. If you have 500 credits to spare you can actually offer to help Queedle for which you gain 100 XP and some LSP. Return to Queedle after winning a race, reloading, or reentering this area, and he will return your loan and you gain 200 more XP as well as get another chance for some LSP. Be aware that by helping Queedle it will make it slightly more difficult to win all three rounds. You cannot help him if you beat his time first so you must lend him the money before you begin racing. If you decide not to help him, Hukta will threaten you not to win if you win the first two rounds, though he doesn't make good on his promise. For information on how to win the races click here.